Corporate blogs have become an integral part of corporate communication. However, the success of these blogs often falls short of expectations for many reasons. If a corporate blog is set up as the center of organizational communication, it cannot serve only as a content outlet. It has to be THE base camp for content creation, content distribution, and social engagement. Used in this way, it will fuel your content marketing strategy and even save time, money, and resources for content creation. 56% of bloggers who maintain business blogs say it has helped their company establish a position as an industry thought leader. 81% of businesses reported that their company blog is useful to critical for their business. The average company that blogs, generates 55% more website visitors, 97% more inbound links, and 434% more indexed pages. In the age of the social web, feedback channels are decisive factors for success or failure of corporate communication. Most corporate blogs struggle with low reader interaction. 64% of corporate blogs have no comments at all. And only 5% of corporate blogs have three or more comments per article. One reason for the lack of interaction is the lack of relevancy of the content itself. Other reasons are the lack of consistency in publishing, insufficient focus on relevant topics for target groups, and a lack of content distribution on different channels and communication outlets. Many corporate blogs are managed as a stand-alone marketing channel, sometimes even outsourced to editors or agencies. These blogs are not integrated with other marketing and public relation campaigns or social media activities. The most significant dilemma, however, is the lack of a consistent content marketing strategy in corporate communications. This problem is most evident in the discrepancy between the content created by corporate marketers and the content expected by customers. Essentially, content is not adapted to the search behavior of customers and business decision-makers when they are looking for information on products or services. While 75% of business decision-makers are looking for substantial ideas and inspiration, while 93% of marketers continue to communicate content directly related to products and services. The mismatch between content and marketing (Source: The Economist Group – Missing the Mark). Industry reports, studies, and trends (81%). Relevant content is the new currency on the social web and the key to new customers. Only relevant content gets likes and shares. 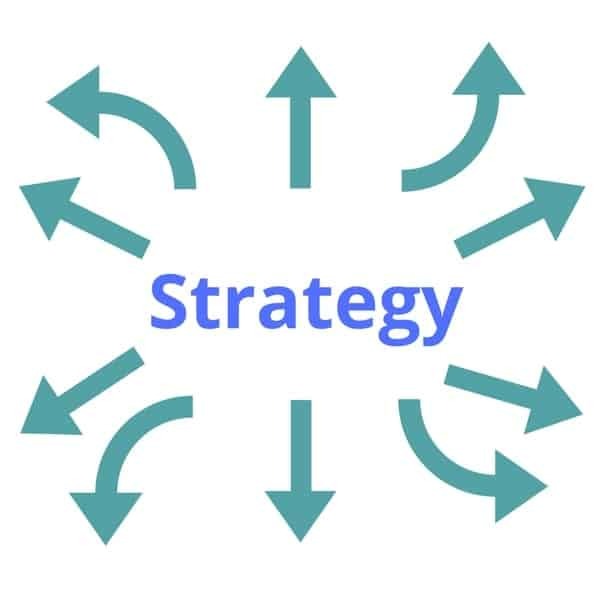 A content marketing strategy for corporate communications needs to shift the focus from content directly related to products, services or the company itself, to content that customers and prospects are actually searching for. The purpose of content is to pull and not to push customers and prospects towards a product or service. Relevant content has also become a key factor for search engine optimization (SEO). With the growing complexity of search engine algorithms, the visibility of content primarily depends on the individual search behavior and current interest of users. When you blog for SEO purposes, optimizing content for each customer’s search behavior must play a vital role in the content creation process. Ironically, most companies are sitting on a real treasure trove of valuable content, often without realizing it. Notably, companies with complex products and services have lots of specialized know-how and expertise. However, this content is often hidden in databases, presentations, brochures, and other internal documents, or, even worse, slumbering in the minds of employees. Instead of just publishing and sharing this valuable content with their customers, companies are hiring blog editors and agencies to create new blog content that is not relevant to their customers. A corporate blog is an excellent marketing tool to create a valuable resource center of relevant content along the sales process. Corporate blogs, which are actually sharing their organizational expertise with their customers, targets, and influencers, can also establish their blog as a vivid customer communication center. Corporate blogs can play a substantial role in providing content to support lead generation and customer loyalty as well as for up-selling and cross-selling strategies. And, more importantly, they can provide vital feedback for creating new content that’s tightly related to current topics and discussions. All in all, a successful corporate blog needs a consistent content marketing strategy. Most corporate organizations invest in content marketing – to some degree. 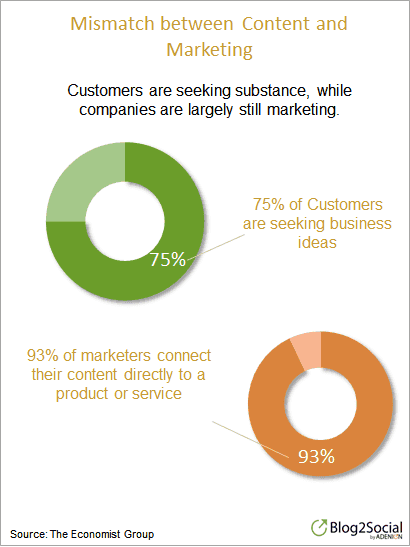 According to current research, 91% of survey respondents are using content marketing. However, teams are lean and budgets are tight, indicating that many companies are still in the early stages of content marketing. 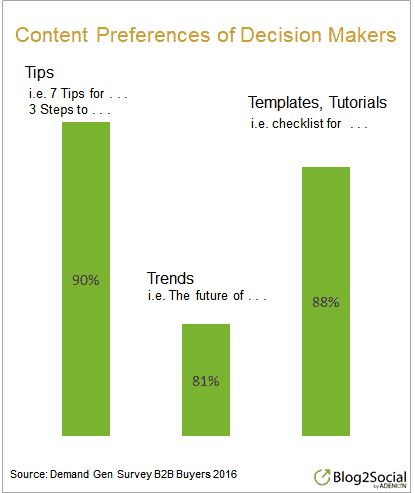 Only 25% of respondents say that their content marketing strategy is mature. Just 36% say their organizations are “very committed” to content marketing. While 37% have a documented content marketing strategy yet. However, several companies have already integrated content marketing into the heart of their corporate communication strategy. With content tailored to help users become more productive at work, the Evernote blog is a valuable resource. 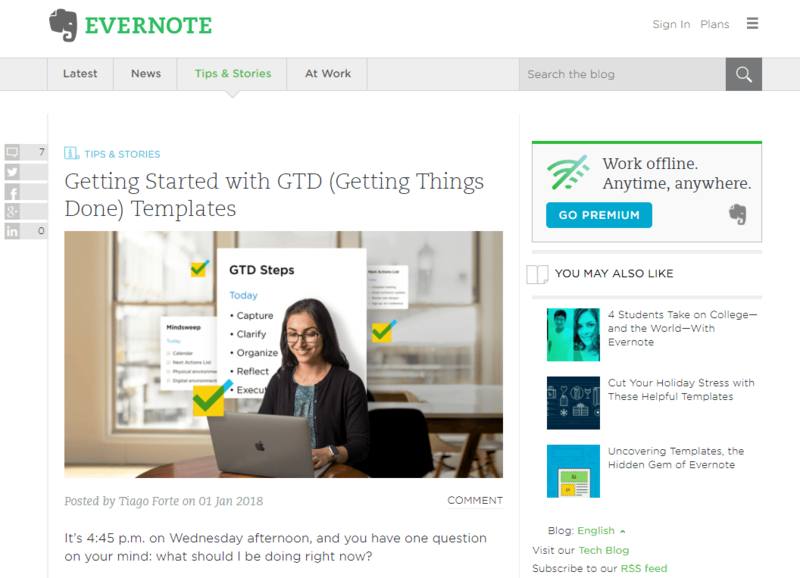 Evernote corporate blog with GTD templates as help content for clients. The outdoor gear and equipment shop REI takes a journalistic approach to their corporate blog, called the “Co-Op Journal”. It offers stories, advice, and tips for outdoor and outdoor sports enthusiasts, as well as travel tips and specialized help content for specific outdoor and sports activities. With travel tips and adventure stories from other REI members, aka REI customers, the company actively involves their customers in the content generating process and thus provides content that’s focused on the interests of the outdoor community. REI corporate blog with travel tips and adventure stories from other REI members. A similar journalistic approach can be found on the Chase’s News & Stories blog. The site is loaded with content helping customers to make the most of their money. It’s varied and yet still targeted to Chase customers. Current news on shifts in market rates or legislative updates is skillfully mixed with evergreen content that bank customers most commonly need. Basic information for obtaining a business loan, saving for retirement or buying a house is regularly refreshed, based on current trends and events. Spinning evergreen content from existing content makes it more likely to attract new customers and prospects. Plus it also extends its lifetime and saves resources for creating original content. 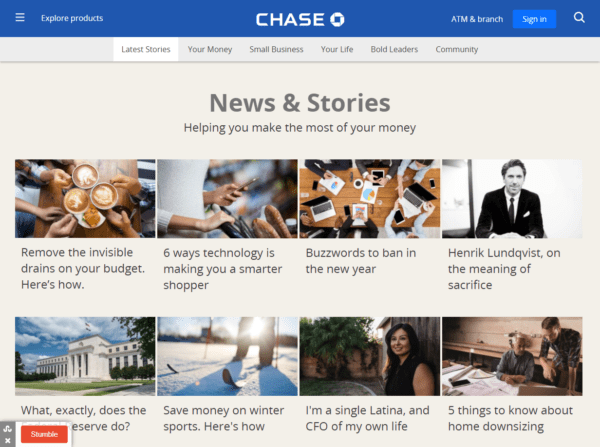 Chase’s News & Stories blog. The site is loaded with content helping customers to make the most of their money. A sustainable content marketing strategy uses content to satisfy the needs and interests of your customers throughout the sales cycle. A customer-centered content marketing strategy requires input and feedback from all customer touch points plus the collaboration of all departments. It involves customer communications, such as marketing, PR, and social media, as well as support, sales, and customer service. Therefore, you can use the current issues from support and customer service as editorial input, just as much as the information gathered from marketing and PR. Once you’ve established the content strategy for your corporate blog, you can create a content syndication and seeding plan. Re-using content for multiple media formats and channels will save time, resources, and money on creating new content across various campaigns and activities. It also extends the lifetime of the content and increases its visibility in search engines. Syndicating blog content for newsletters, press releases, mailings, infographics, videos, and social media posts will increase your visibility and likelihood of attracting customers and prospects. The more formats and channels the content has, the more likely your targets will find and read it. Your corporate blog acts as the central editorial office, distribution channel, and resource center for PR, marketing, sales and social media. You can re-use content from the various stages of the purchase decision process in your sales and marketing campaigns. Likewise, you can re-use information content (e.g., How-To articles) for support and customer service, internal communication, and education. Overall, the corporate blog serves as the primary input and output channels within your company. Establishing your corporate blog as a content center also turns it into a distribution and seeding channel. The easiest way to distribute content on the internet is via social media. There are social media marketing and automation tools and plugins to link your blog directly to social media, so that you can distribute the content to social networks such as Twitter, Facebook, LinkedIn, Instagram, Pinterest, and YouTube. Successful social media marketing is not just about pushing your content out into the world, but also taking time to engage with the social communities actively. Even if you share the same content across multiple channels, you have to address each community in a slightly different way to encourage feedback and interaction. Make sure you remember these essential criteria when selecting your social media automation tools. Each network provides different options for presenting content, and every community reacts differently to specific content and formats. Setting up a social media cross-promotion strategy can help you work out the best way to encourage engagement across all social channels. Sharing your content skillfully across multiple channels helps to increase its reach and lifetime considerably. Furthermore, social media, in particular, is also a valuable feedback channel and source of current issues and discussions, which in turn can serve as input for new content. Successful corporate communication with corporate blogs can play a pivotal role in establishing a company’s position as an industry thought-leader. A successful corporate blog will attract more website visitors, generate more leads, and convert new customers. Corporate blogs with a solid content marketing strategy can also create more inbound links and more indexed pages for increased visibility on the net. A corporate blog needs to be set up as a strategic content creation lab and resource center, as well as a central hub for social engagement if it’s to become the primary hub of your corporate content marketing strategy. When you position your corporate blog at the center of internal and external communication, its multi-purpose content can be re-used and syndicated for various campaigns and activities. It will save you valuable time and resources, and also boost efficiency, sustainability, and visibility. I believe an ideal content strategy comprises different components which help us to map the different steps of content planning. 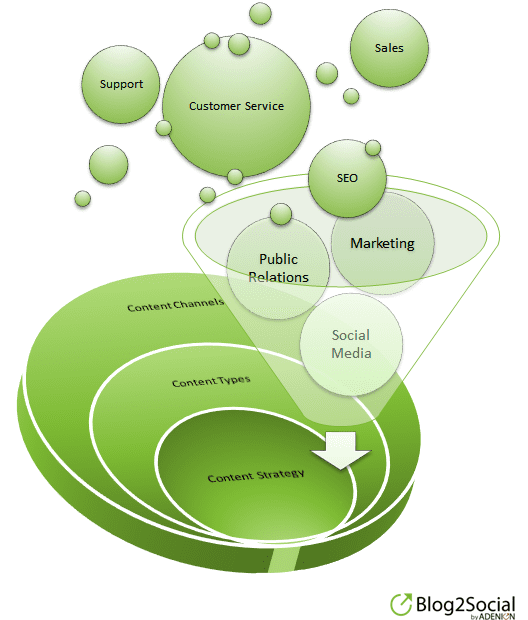 An ideal content marketing strategy offers real value to our prospects. Your unique style of writing down your points are the things that amaze me. This is really a helpful post. Thanks! Really, It is a very helpful and informative post. Your all information is always very helpful and great. Thank you for your such a great blog. Very informative post! I agree with you on corporate blog is an important factor to attract more website visitor and generate lead. Thank you for adding. keep up the good work. 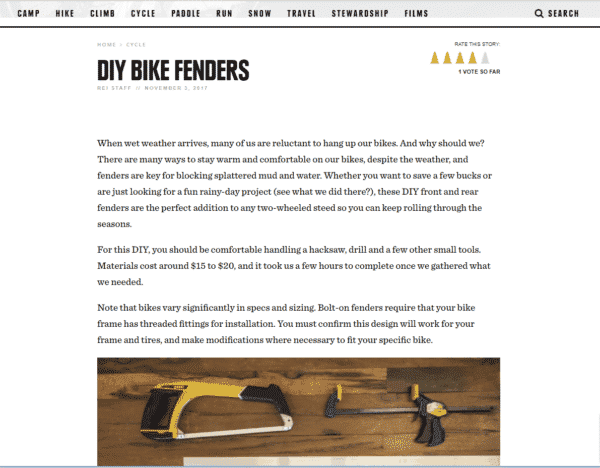 Nice article on how a good blog with strong content can help in the improve the visibility on the net.